1.) ... Disabling or activating the automatic recovery points! 2.) ... Where to find the windows recovery points (.img extension)! 3.) ... Do I need Windows restore points? See also: ► ... manually create a restore point! 1.) Disabling or activating the automatic recovery points! To disable or to enable the automatic creation of system restore points in Windows 8 please press the key combination [Win-Logo] + [R], then simply type in the command sysdm.cpl ,4 ( ... see Image-1 Arrow-1). By enabling system protection, you can undo undesired changes by reverting your computer to a previous point in time. To Disk Space Usage: You can adjust the maximum disk space used for system protection. As space fills up, older restore points will be deleted to make room for new ones. And also:Delete all restore points for this drive. 2.) Where to find the windows recovery points (.img extension)! ►►► ... restore system files and settings! Hot-Tip: Activate password query with the screensaver! 3.) Do I need Windows restore points? System Restore is a Windows feature that can be used to fix certain types of crashes and other computer problems. Helpful feature on Windows, which is very helpful when set up and easy to use when things go wrong. System Restore has been around for a long time in MS operating systems and works almost the same in every Windows version. The instructions here are for Windows 10 (Redstone 4 & 5) Pro, Enterprise, Home, Windows 8.1, Windows 8, Windows-Server 2016, 2012, 2008, Windows 7 Basic, Professional, Starter, Ultimate, and there are few differences. ►►► Restore system files and settings from a Windows Restore Point! Win 8 not creating auto retore points? How often created windows 8.1 restore point? Disable system restore points windows 8.1? Script create system restore point windows 8? How to disable driver restore software for windows 8.1? Creating an automatic system restore in windows 8.1? How to create automatic restore point windows 8 and Windows 10? Enable restore points windows 8.1 or how to set up automatic system retore on windows 8? Setting an automatic restore point in Windows 8.1 and Windows 10? Window 8.1 auto delete restore point? Windows 8.1 not creating automatic system restore points? Ow to enable system restore in windows 8.1? Disable Automatic Recovery Windows 8.1? Windows 8 system restore Auto create and how to make restore points automatic on windows 8? Enable system restore windows 8.1 command line? Create Windows 8.1 automatic restore point? Windows 8.1 automatic restore points enable / disable and adjust? Win 8.1.1 automatic restore points and vss? Automatic System restore point creating software for windows 8? Windows 8.1.1 disable automatic recovery? Windows 8.1 automactic create system restore point? Automatic system restore points windows 8.1 and Windows 10? Windows server 2012 disable system restore? Set an automatic restore point in windows 8? Windows 8.1 enable restore points? Windows 8.1 recovery time of automatic? System restore windows 8.1 automatic create points? Enable restore points in Windows 10? How to enable automatic restore points e.g. how to set automatic restore point? Windows 8.1 screen saver disabled automatically revert? HOW TO STOP[ windows auto recovery WINDOWS 8.1? Windows 10 automatically create recovery point does not find the option under Windows I do not need to install the recovery point software or create a folder? Can not find previous restore points even though I created restore point on Windows, what am Can not find recovery points, restore points I've activated can I view the / all restore points? For Windows 8.1: Let's create restore point, can I view or find these system restore points? Prompt Finding and Displaying Recovery Points Windows 10? Disabling automatic system recovery Windows 8 / 8.1 / 10, Creating system restore point I do not need more? Computer Protection Windows 8: Set restore point and change system restore point? Windows 8.1 Set Windows restore point when to automatically create the restore point? Windows 10 Computer Protection Maximum Occupancy View recovery points and view space usage on Windows 10? Dell system restore points win 10 and regularly create restore points? Automatic system manufacturing point, system restore point display on Lenovo notebook? Where can I find the recovery point to delete recovery points on Windows 10 MS Surface? Restore point Medion W8.1, restore time Windows 8.1 and dan on Windows 10? Automatic recovery point, recovery point Windows 8.1 / 10 does not succeed, why? Find recovery points 8.1 to set automatic recovery points and delete old recovery points w 10? 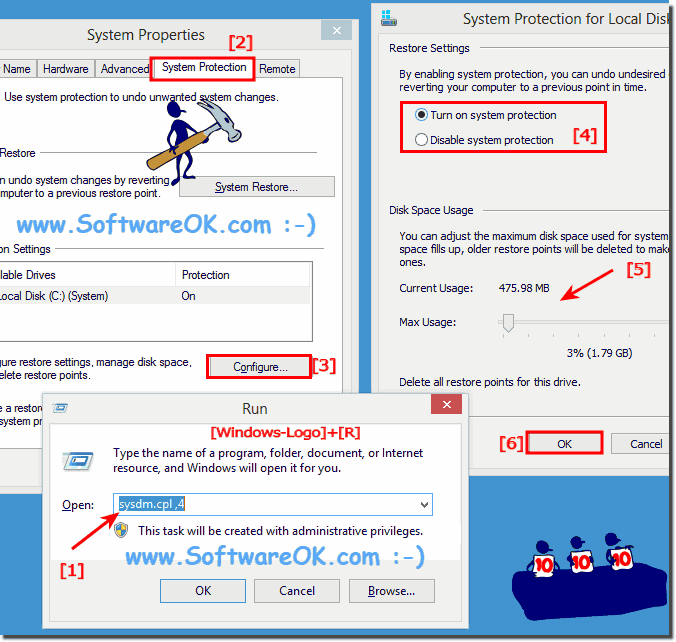 Enable Windows 8.1 / 10 System Protection to create regular restore points, but how? What is the ending of a recovery point? Windows 8.1 automatically adjusting volume? Sysdm.cpl.4 win 8.1 to enable windows restore points? Command script for system restore 8.1 can i enable multiple restore point in window8? How to untick drives in create system image in windows 8? How to stop windows from creating restore? Command line stop system protection win 8.1? Enable restore point windows 2012? Windows 8.1 automatic restore points?